As Australians we all face the daily challenge of changing the way we live our lives by making better choices towards a more sustainable future for us all as a part of the global community. In light of the threats of climate change this Seaweek 2009 is a timely reminder that this is a "A climate for change" and "Education and Action” is the way so many of our schools and community members are engaged in practical hands on strategies to minimise our collective footprint and make better use of our limited finite resources. The members of MESA together with our sponsors and large network of teachers, educators, education centres and proactive community groups will bring together this Seaweek a compilation of great resources to highlight aspects of our unique biodiversity, the threats to our unique coastal and marine ecosystems and the actions in place to regenerate and rehabilitate and in turn reduce the stresses placed on the environment. 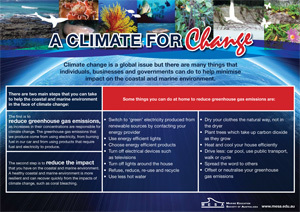 Focus on ways that people can help tackle climate change, cut emissions and protect and preserve biodiversity, coastal and marine landscapes and threatened species. region and Australian marine and coastal environments. helping students and communities to live sustainably. Marine Discovery Centres and Aquaria can access their online community from the website and get better access to resources and information about marine and coastal education throughout Australia. 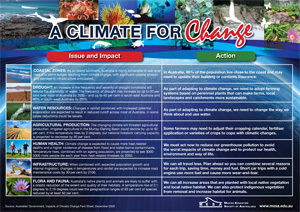 The AUSMEPA “Effects of Climate Change on Coral Bleaching” educational program is designed for middle years students. The website program shows students why coral reefs are being damaged by increases in sea temperatures, and how this can be linked to climate change. The program brings together all the science and conservation issues of these current environmental topics. The educational program contains a complete unit of work including teacher's resources, curriculum materials and student activity sheets. A to Z of Australian Marine Life - This compilation of Marine Creatures is a small taste of our amazing Australian marine biodiversity most of which in some way may be effected by climate change through Ocean acidification and Habitat loss as examples. Seaweek 2009 Gallery - The Photo Gallery is a compilation of several MESA members' contributions and has been provided for use for a range of educational possibilities. 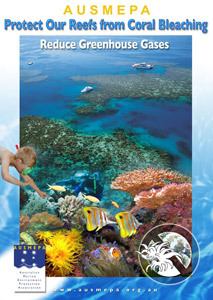 Teaching ideas for Seaweek 2009 - The units are your online curriculum resources for K-10 classes. The units offer a range of ideas and activities for the early, primary, and middle years of schooling, There are also teaching ideas associated with the A to Z of Australian Marine Life and the Seaweek 2009 Gallery. Action Projects - MESA membership is about active involvement in education and understanding of marine environments. MESA members regularly assist in projects that have national and global implications for better understanding of environments, global warming and other big issues. impact on the coastal and marine environment.